Matt Murdock is a man of many guises, but he needs you to protect his very best one: Daredevil. Click here to play! Join forces with the superhero and rid the city of evil. Along the way, you will find yourself earning plenty of real cash payouts and winnings! 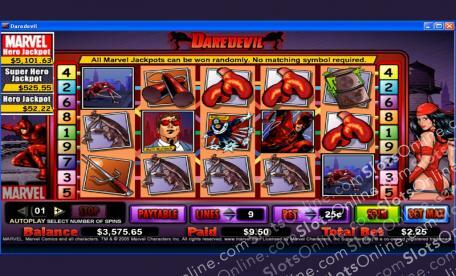 Daredevil is a 5-reel slot machine that is played across nine pay lines, with the more coins played multiplying the payout odds on winning combinations. Daredevil is a Substitute and can become any other symbol in the game except Scatters. In addition, if you manage to make the Daredevil into a winning combination, the prize will be doubled. The Scatter symbol can pay out when two or more of them appear on any active pay line, and can earn you up to 100 times your initial wager. Join forces with Daredevil today and win yourself a massive cash jackpot in the process! The Daredevil logo is Scattered and can earn you up to 100 times your initial stake. Also, if you manage to find three or more of them at any one time, you will be sent straight to the Bonus Round. Daredevil is Wild and can substitute for any symbol on the reels except Scatter. It will appear on reels 2 and 4, and double any winning combination. When 3 or more Scattered Daredevil logos appear, the Bonud Round will be triggered where you can win up to 1000 times your triggering bet. "Cryptologic slots give you the option of any number of auto play spins up to and including 99. It provides a delay between each spin between 0.25 and 2 seconds, giving you time to see exactly how much money you win each spin. Cryptologic also gives you the ability to stop your auto spins when a jackpot is won, a single win exceeds a dollar amount, any win, an increase or decrease by a predefined amount or simply, when the number of spins are complete."